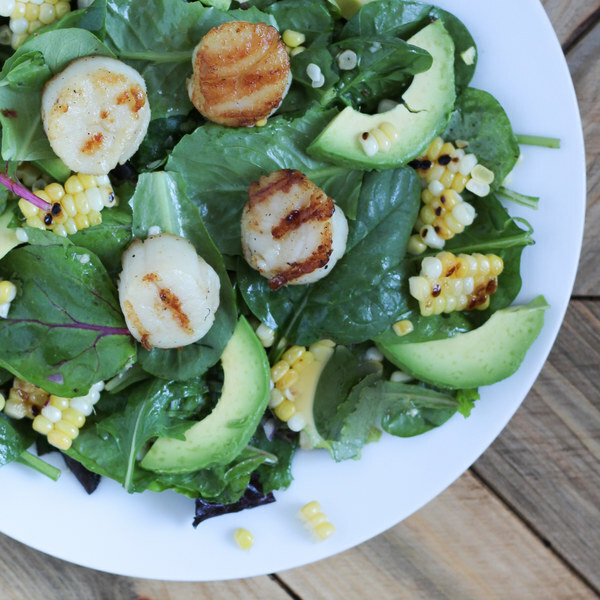 ← Grilled Scallops with Corn, Lime and Avocado Salad. Lightly oil grates or pan. Remove husks and silks from corn. Grill corn, turning occasionally until corn begins to char (8-10 min). Set aside to cool. While the corn cooks, peel and finely chop the shallot. Transfer to a medium bowl. Juice the lime into the medium bowl; add olive oil, cumin, salt and pepper and stir to combine. Pat scallops dry with paper towel. (If using an outdoor grill, thread scallops, side by side onto skewers so that scallops lie flat.) Drizzle scallops with olive oil, salt, and pepper. Grill scallops until grill marks appear about 2-3 minutes, flip and cook other side) about 2 minutes. Working one ear at a time, hold the corn vertically inside a large bowl and slice the kernels away from the cob; discard the cob. Add the kernels to the salad dressing. Halve the avocado and remove pit. Thinly slice the flesh while still in the skin and then scoop out the slices using a spoon. To serve, toss lettuce with corn mixture and avocado, arrange on a plate, and top with grilled scallops. Enjoy!